I’ve attempted several articles on pastels only to abandon the project when the photos turned out poorly. These photos on the ice green pieces leave much to be desired but it’s the best I’ve been able to do. All Carnival is difficult but the pastels are next to impossible, at least for me. When we speak of pastels, we’re talking Northwood. 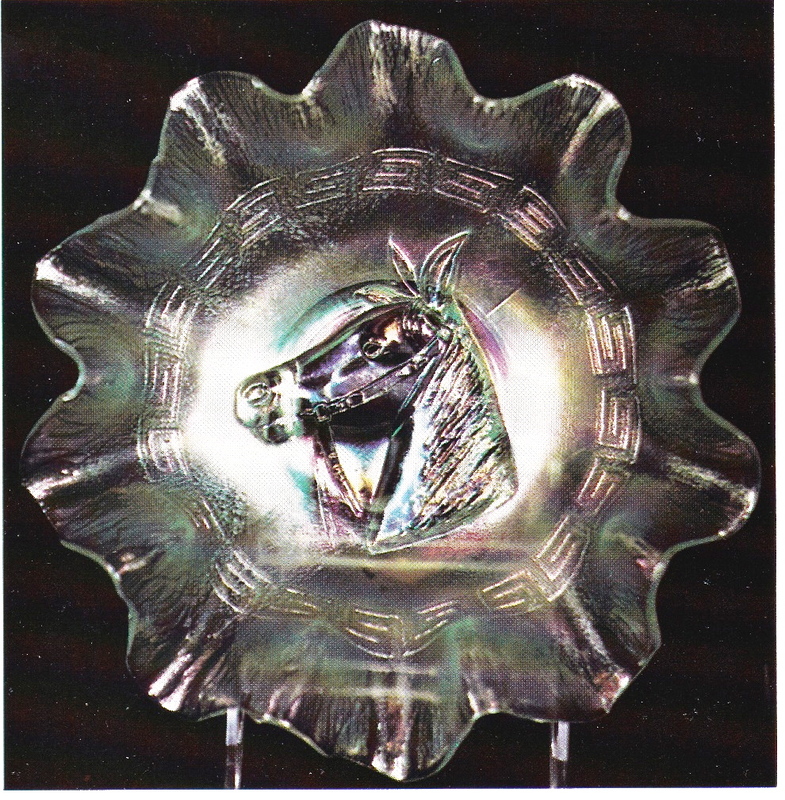 With the exception of the Pony bowl, each of the pieces shown here are Northwood. 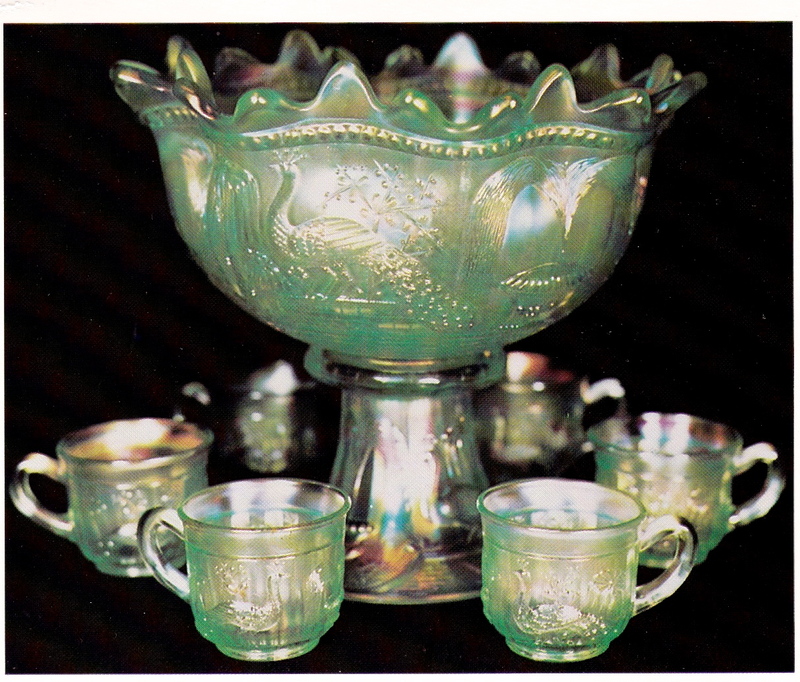 To be sure Fenton and Dugan did make a few pastels but they are so limited as to be almost experimental in nature. When we discuss ice green, it is less complicated than writing about ice blue. In addition to ice blue, we also have celeste blue, sapphire, Persian blue, etc. With pastel green we have ice green and that’s about it. Now and then we call a piece “lime green” or “mint green” but these are rare exceptions. Even Northwood made limited amounts of any of the pastel colors. They were apparently not good sellers. This means, of course, they are harder to find and harder to afford. 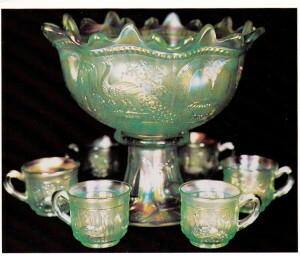 The past few years have seen a dramatic rise in the price of pastels, with ice green one of the more sought after colors. Let’s take a brief look now at the pieces in the color spread. 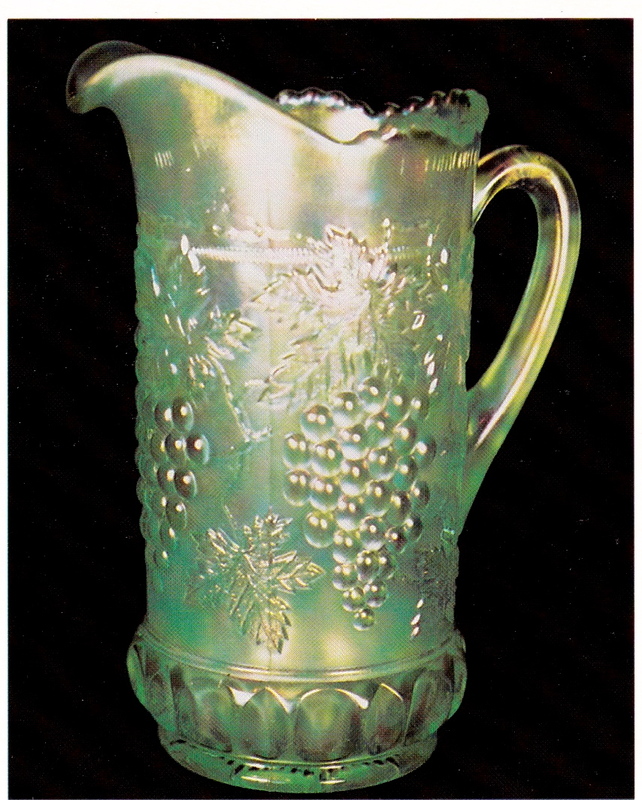 GRAPE AND CABLE tankard water pitcher. One sold at auction in 1980 for $2,500 and again in 1984 for $2,400. The standard size pitcher and tumbler are equally rare with a tumbler bringing $1,000 in 1986. 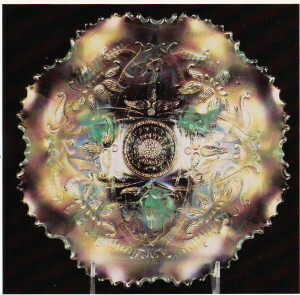 ROSE SHOW plate. Very few known. One sold for $3,800 at the 1989 International Convention auction. 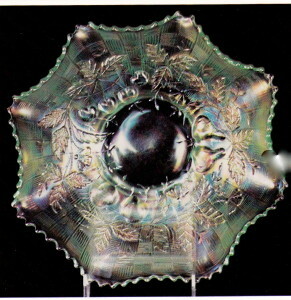 WISHBONE footed bowl. Rare and desirable. 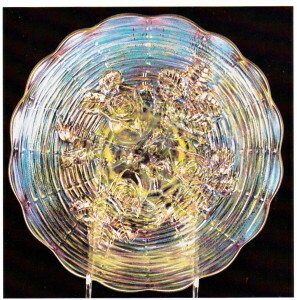 Sold for $1,850 at auction in 1987. N. PEACOCKS piecrust edge bowl. 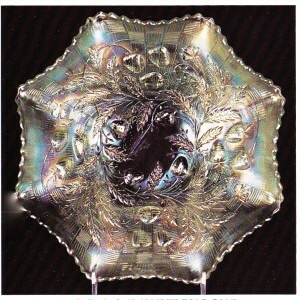 Though easily available as a plate it is quite rare in either a ruffled or piecrust edge bowl. I can’t find where a piecrust edge has sold at auction but it wouldn’t be far behind the $3,000 paid for one in ice blue in 1987. WILD STRAWBERRY bowl. 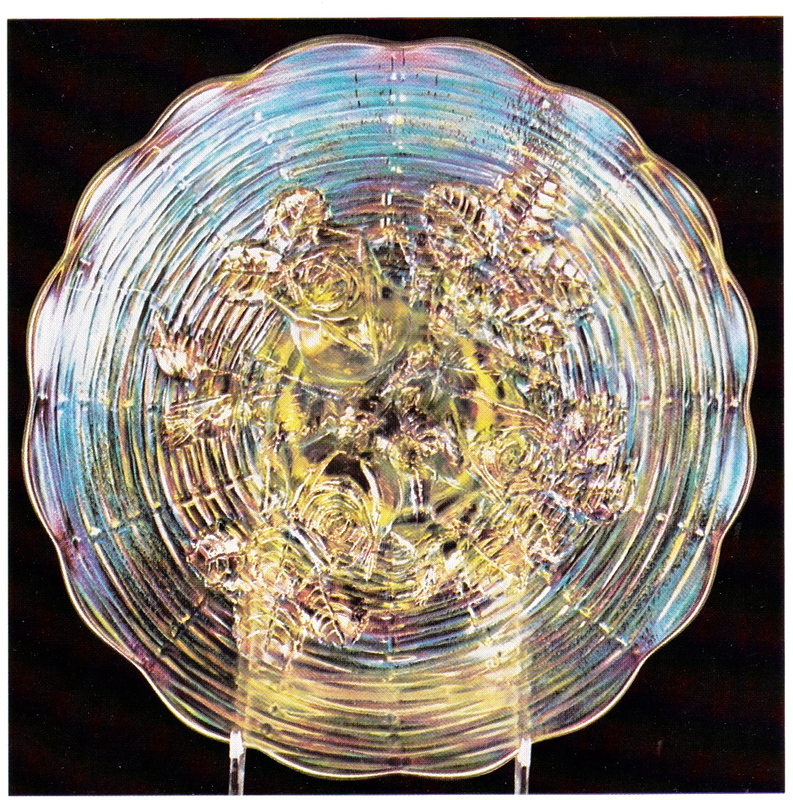 Often confused with Northwood’s standard 9” Strawberry bowl. 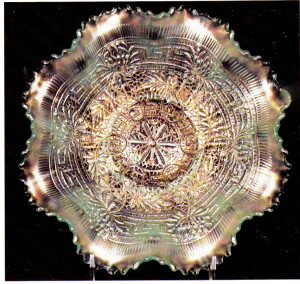 This is a large 10” piece, with a somewhat different strawberry pattern and is seen only in the ruffled bowl shape as shown. 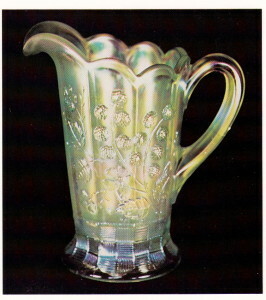 One in ice green sold for $1,325 in 1985. 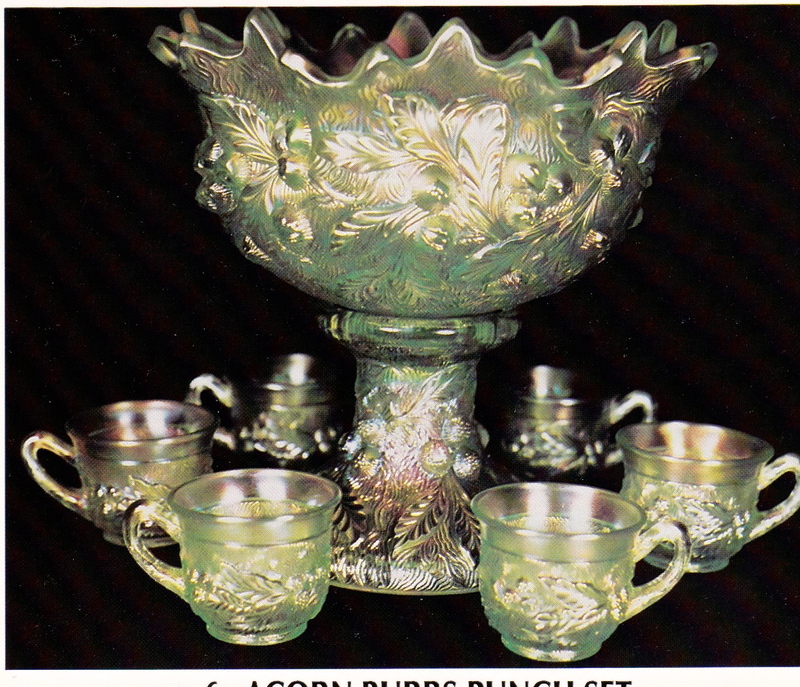 ACORN BURRS punch set. Only 3 or 4 sets confirmed in this color Can’t find that one has ever sold at auction but is no doubt in the $5,000 to $7,500 range. 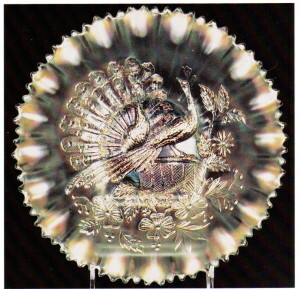 PEACOCK AT THE FOUNTAIN punch set. Somewhat more available than the Acorn Burrs. Three have sold at auction over the last ten years. They brought $2,500, $2,600 and $2,800. EMBROIDERED MUMS bowl. Much harder to find in this color in a bowl than in a plate. 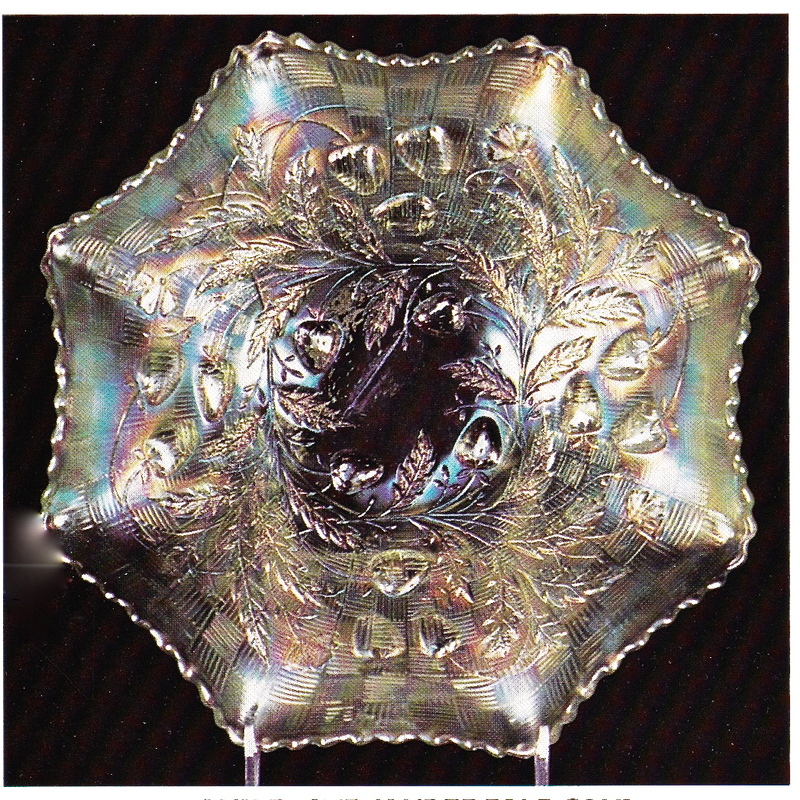 I can’t find that a single bowl has sold at auction since auction prices have been compiled. During the same period more than a dozen ice green plates have sold. N. RASPBERRY milk pitcher. Tough to find in ice green, ice blue, or white. One has not sold at auction in ice green since 1981. It brought $1,300. 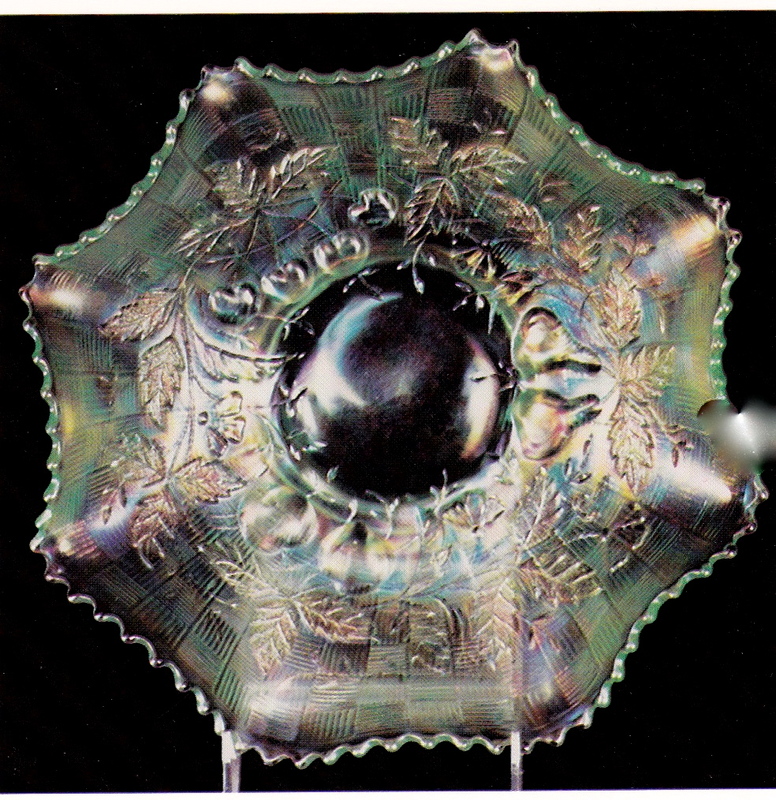 FRUITS AND FLOWERS bowl. Often confused with Three Fruits. In both size and shape this bowl is to Three Fruits what the Wild Strawberry is to N. Strawberry. Very scarce in the pastel colors. One in ice green sold for $750 in 1983. PONY bowl. It’s been hard for me to credit this to Dugan, but in the absence of any proof to the contrary, I reluctantly go along. Scarce in this color. One sold for $525 in 1986. Would bring more today. GRAPE ARBOR water pitcher and tumbler. This is a rare one. No more than 3 or 4 pitchers are known. Much more rare in ice green than ice blue or white. 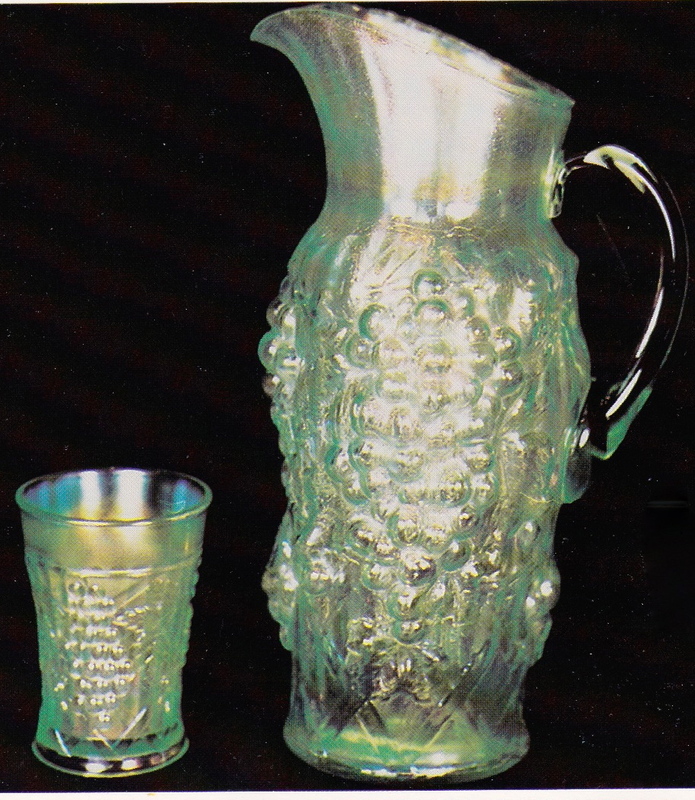 A cracked pitcher sold for $2,450 at the famous Wishard auction in 1977. Tumblers have sold in the $300 – $400 range in more recent years. Here is my best shot at ranking the top pieces in ice green. The accuracy of this listing is not guaranteed. Any use must be at the readers’ own risk of being ridiculed, ostracized, and ultimately exiled to a snake infested island in the Caribbean.